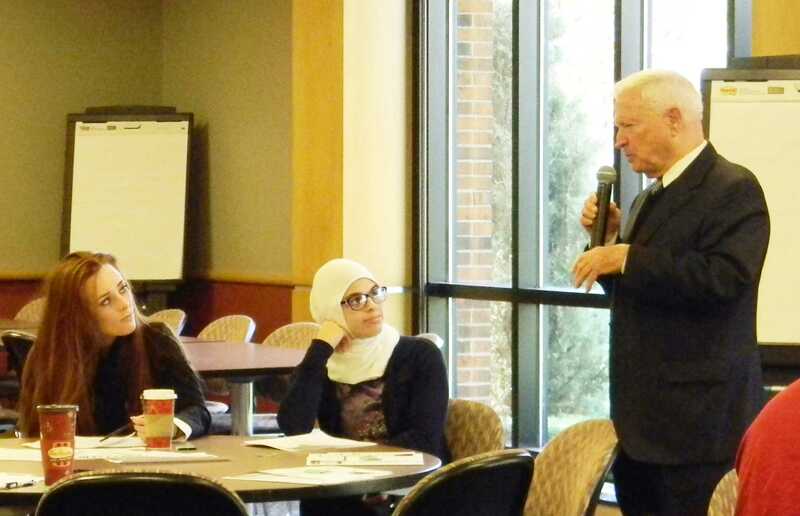 Livonia Mayor Jack Kirksey took to Schoolcraft College to deliver a workshop for students considering future political careers, offering his advice and experience to political hopefuls. The event was organized by the University Bound program in conjunction with the Communications and Political Science departments. President Dr. Conway Jeffress and University Bound Director Dr. Silverenia Kanoyton introduced the mayor. Livonia Mayor Jack Kirksey stresses the importance of personal relationships while running for office, in response to a question asked by Phi Theta Kappa President, Sarah Osen (left), seen here with Amani Elder. Photo by Abigail Snyder. Kirksey is institution unto himself, with a deep and long-running history in the city of Livonia. A Detroit native, Kirksey moved to Livonia to pursue a teaching career in the fledging Livonia Public Schools (LPS) district. Originally planning to be an automotive engineer and designer, he went on to describe how teaching at an area YMCA sparked his passion for education. Obtaining his BA and MA from Wayne State University, Kirksey also went on to become a Lieutenant Colonel in the Air Force reserve. The mayor has a rich educational background, serving as a teacher and administrator at LPS, a former Schoolcraft Trustee, and currently serves on the boards for the Madonna Foundation and LPS Foundation among others. Not originally interested in politics, Kirksey told of how he and his wife Patt became involved with campaigning for friends in Livonia. Breaking the pledge he made to his family to “never become the candidate,” Kirksey would nonetheless go on to become more involved in local politics, sitting as representative for the 35th District in Lansing from 1977-84, as well as serving as mayor from 1996 to 2003. He was elected to the mayor’s office twice more in 2007 and 2011, with his current term expiring in 2016. Throughout his presentation, Kirksey stressed the importance of being a good communicator and team member. He advised students to be aware of their own strengths and weaknesses and to put their names out in their local communities. A veteran of 47 consecutive successful campaigns, he joked about being turned down for Mitt Romney’s campaign team while stressing the importance of keeping the best people to have on your team. Kirksey mentioned the importance of humor on the campaign trail: “It helps people see you as human,” and helps candidates create relationships with voters. Describing some of the pitfalls of running for office, Kirksey advised students to take a step back and evaluate themselves as often as possible. Student Marwah Baidoun asked Kirksey about how to approach voters who may discriminate based on race, gender, or religion, to which he said, “Never go in with the apology.” He drilled the point, going on to tell the audience they should never compromise their identity and to stick to the issues, rising above any stereotypes or preconceived notions voters may have. Responding to Sarah Osen, Chapter President of Phi Theta Kappa, Mayor Kirksey said the best tips he could give to those seeking office are to engage the people you know, create a wide network of acquaintances and friends, and to delegate to the best people for the job while giving them the tools they need to get things done. Friendship became one of the surprising themes of the workshop. Building on a friendship of over 30 years, Mayor Kirksey and Dr. Jeffress have worked together to help Schoolcraft become one of the best two-year colleges in the state. “The mayor has an open invitation to visit the college any time he likes,” said Dr. Jeffress, and indeed, the gears are in motion for an encore workshop with the mayor in the near future. Dr. Kanoyton praised Dr. JuJuan Taylor for spearheading the effort to get the mayor to the workshop, describing it as a months-long labor of love. The mayor plans to partner with the college for future endeavors, including working together on a new veterans employment task force in the city of Livonia and celebrating the new partnership between Schoolcraft, Wayne State University, and the University of Toledo.